Civils contractors today welcomed Transport for the North’s ambitious £70 billion blueprint to support transformation of the North’s economy and look forward to a clear delivery plan to meet the urgent transport needs of the region. TfN’s Strategic Transport Plan and Investment Programme outlines how a £70 billion investment over thirty years would contribute to an additional £100 billion in economic growth and create 850,000 jobs. Commenting, Transport Initiatives Director for the Civil Engineering Contractors Association (CECA) Chris Jackson said: “CECA has long been a strong supporter of rebalancing the economy and we welcome this comprehensive transport plan to transform the economy of the North – and peoples’ lives – for the better. “It is vital that there is a system in place to monitor the delivery of projects and to continue promoting the economic and social case for infrastructure investment in the region. 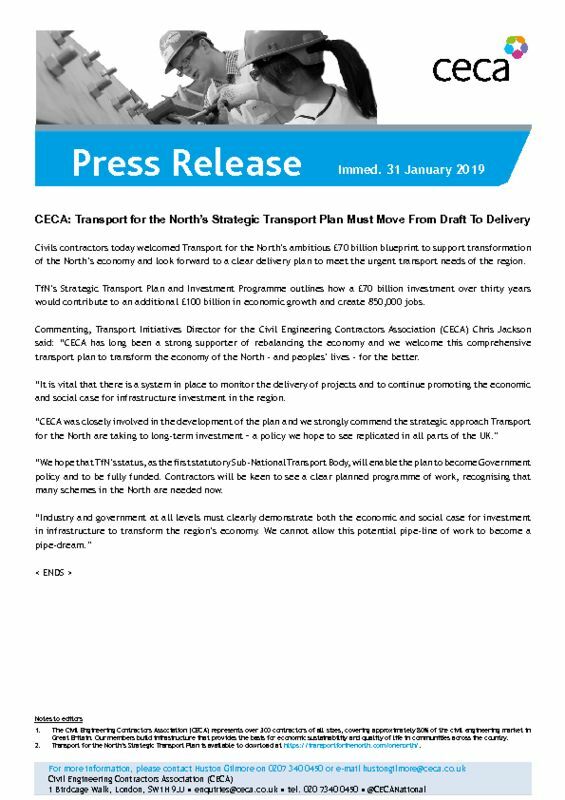 “CECA was closely involved in the development of the plan and we strongly commend the strategic approach Transport for the North are taking to long-term investment – a policy we hope to see replicated in all parts of the UK. “We hope that TfN’s status, as the first statutory Sub-National Transport Body, will enable the plan to become Government policy and to be fully funded. Contractors will be keen to see a clear planned programme of work, recognising that many schemes in the North are needed now.